Michael Obergas, 2-months old, was mauled to death by at least one family dog. UPDATE 08/21/17: Houston Police have identified the 2-month old baby killed by one or more family dogs. Michael James Obergas was pronounced dead at Memorial Hermann Greater Heights Hospital on Saturday, according to investigators. 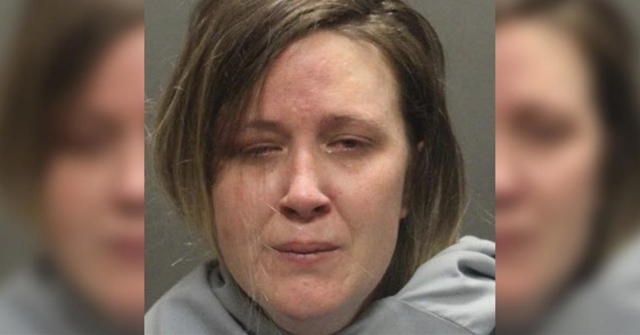 Police said the baby was in a bassinet in a secure bedroom, but one of the dogs was able to open the door and attack the baby. Police and news reports did not made clear which of the two family dogs carried out this deadly attack. KTRK interviewed a veterinarian, Dr. Hallie Ray Moore. "You should never ever leave the baby alone in the presence of a dog," Moore said. "However, it doesn't sound like that was even done in this case. This is just worst-case scenario," she said. 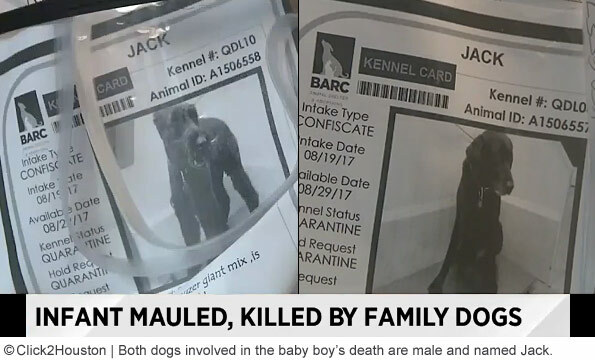 The two family dogs, a giant schnauzer and a labrador retriever, were both male and named Jack. Neither their ages nor neuter status was released. The baby's parents were questioned and released by police. No charges are expected. 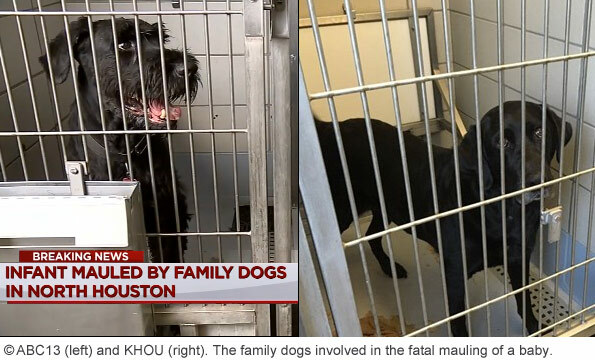 Houston, TX - A 2-month old baby boy is dead after being mauled to death by two family dogs on Houston's north side. The baby was lying in a bassinet when his parents stepped away. The dogs, described as a giant schnauzer-mix and a labrador-mix, primarily mauled the baby in his torso area. KTRK captured video images of the animals. The two dogs, both named Jack, were surrendered to BARC, Houston's animal control agency. 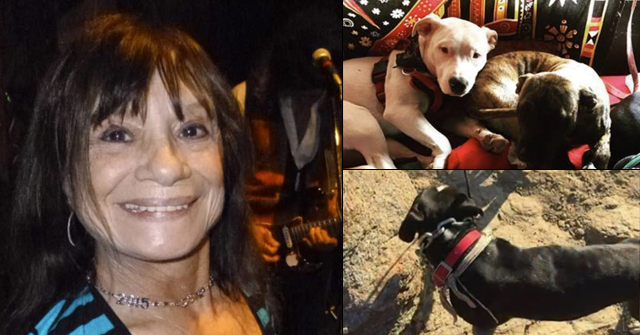 Both dogs have been euthanized. 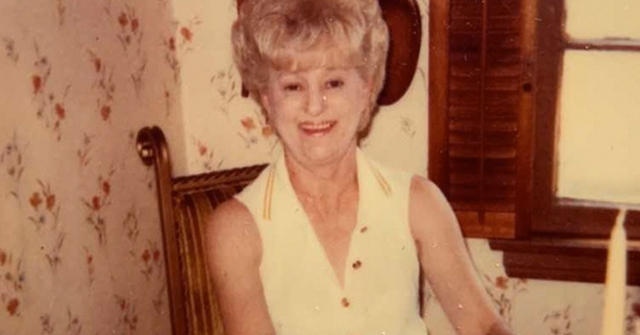 The Houston Chronicle reports the attack occurred about 3:10 pm Saturday in the 5900 block of Nelwyn Street, just inside Loop 610 (other reports say Friday afternoon). Homicide detectives are investigating the baby's death. Authorities have not released the name of the child. Police said both dogs were transported to BARC following the attack. Officials confirmed to KTRK the dogs were put down Sunday evening. Their bodies will be sent to a city lab and tested for rabies. I'd sure like to know what kind of MIX these dogs were. Children are left alone with family pet dogs all the time and there are no problems. If there were, we'd have millions of dead kids. The real problem is that people are now letting aggressive breeds into their home, and their kids suffer the consequences. I do feel some sympathy because too many "experts" are trying to convince the public that all dogs are the same. They are not. A good family pet dog doesn't attack kids. We have a crisis of deadly dogs being sold, bred, and harbored. I think that it is high time to start questioning the promotion of dogs as family pets. Especially in homes with infants or small children. I've said it before and I'll say it again. There should never be a large breed dog living in a home with infants and/or small children. It's cruel to force children to live with animals that they have no way of protecting themselves from. It's not that hard to wait until the child is older to buy a freaking dog. And hopefully a safe dog. Not highly aggressive dogs like giant schnauzers, labs, pits, gsds, huskies, etc. Also, why is it that when it's a pit that kills they take forever to euthanize the beasts, if they even do so at all, but this time the dogs are put down almost immediately? That's ridiculous. And they say the nation is biased against pits? Doesn't seem that way to me. Some of the comments above seem to confirm the pit nutter clarion cry of "your breed is next"! Let's be honest. Sometimes non-fighting, companion breeds do terrible things. However, they do not do these things with the terrible regularity of pit bulls and Rottweilers. Just like I'm sure that kids have been hurt by plush toys and plastic blocks–these items still aren't comparable to giving your kids knives and matches to play with. It makes sense to keep pets–particularly large dogs–away from infants, for a wide variety of reasons. At the end of the day, dogs are still carnivorous animals, with sharp teeth and claws. However, only a tiny handful of breeds regularly slaughter human beings. Unlike companion breeds, the fighting breeds were specifically selected for explosive, hard-to-contain violence. Packhorse, I quite agree! That was very well-said and accurate. Let's not fall into the pit nutter trap that's attempting to change how people feel about dogs, repeating mindless knee-jerk phrases like "all dogs bite" and "never leave a child along with a dog." We also really, really need to pay attention to what breeds were developed for and what traits they may exhibit when choosing the dogs allowed around children. Of course there are exceptions to every rule, and I wouldn't advocate that every parent who has a baby get rid of the family dog(s) automatically, just that some thought should go into the traits and needs of the dogs we choose. I'm also of the opinion that large dogs may not be best around little children (I remember how scary it was as a little kid to have my grandpa's exuberant Lab jumping on me)–at least unless they're very calm and well-trained. The Shih-Tzu I got when I was 6 could have bitten me (he didn't), but he couldn't have killed me or even knocked me down. I thought I remembered hearing that the giant Schnauzer may not be a great choice around kids. Here's some info from dogtime.com: "This is a big dog with a big personality. He's an energetic, intelligent companion who makes life interesting with his independent thinking and playfulness, but dominant personality and bold approach to life. In short, he's a handful, even for experienced dog owners. Still, in the right home he's a loyal and courageous companion." The article also notes that they're not recommended around children under 12 and have been used as police and guard dogs. Early on, they were used to drive cattle and in butcher shops and stockyards. They're said to not be a gentle giant but a working dog. The traits that come along with those jobs don't necessarily make the best choice for a child's companion (as a general rule–there are, of course, exceptions). "Bold," "courageous," and "loyal" are buzzwords associated with some of the most dangerous dog breeds and not traits I'd be seeking in a dog to have around an infant. This is just a very sad case as the dog was able to open the bedroom door and get to the baby. It's odd because giant Schnauzers aren't that popular, and this one looked to be well-groomed and cared-for. There are some unanswered questions here, such as what role the older Lab mix played in this attack, if any. As pit bulls are being throughly mixed into the general population of dogs, 'dogs' that don't initially appear to be pit bulls will be killing children. They are most often full or part pit bull, statistically. Until we find that good genetic test for killing genes at play here and the money to use it, we need to ban pit bulls in our communities. I think dog bite attorney Ken Phillips said it best: "Your choice of breed is very important. You should choose among the ones that produce SMALL and GENTLE mature dogs." A large dog is capable of seriously injuring or killing an infant even by accident. I'd put good money on neither of these dogs being a 'mix' – both look like the real thing, pure-bred dogs of their type. I feel immensely sorry for the dog that did NOT attack the baby. My opinion is that the Giant Schnauzer was the culprit; it looks unstable in the video. It is extremely odd that both dogs were called 'Jack' – who does that? The baby was beautiful – it's a terrible shame. 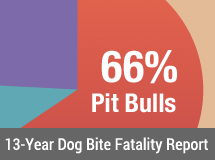 If nothing else, this goes to show that on rare and random occasions, other breeds besides Pit Bulls will do great harm or kill, and it also goes to show that DogsBite.org REPORTS on other breeds besides Pit Bulls that do great harm or kill. Scant consolation for this harmless child, robbed of life, futureless, destroyed pointlessly. It behests all parents to make choices and to know their breed(s) of choice. The Giant Schnauzer can be a formidable dog, especially the males; he is not to be confused with the small, dozy, naughty little Schnauzer that most people envisage. Rest in peace, sweetheart. We won't forget you.